Expect the best in your cutlery. Plantware® Cutlery is compostable AND now even more heat tolerant. New formulation offers 95% stronger handles, 20% stronger fork tines, and heat tolerance up to 200° F without relying on unsustainable virgin plastic resources. 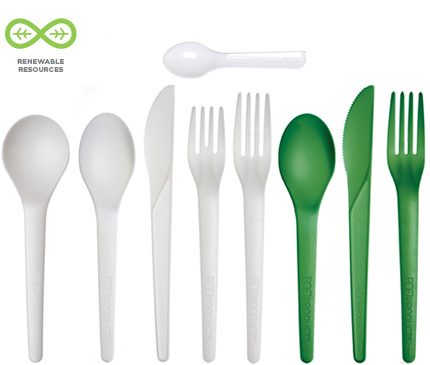 Best of all these utensils are 100% renewable, BPI certified compostable and ASTM D6400 compliant. The new 7" compostable fork is now available. Fully compostable forks are now even more durable, but still 100% renewable. The new 6" compostable knife is now available. Try our new Green compostable forks at your next event. The green soup spoon will look great at the deli bar. You asked for color and we delivered.